If you want to avoid upgrading to iOS 7 to keep your jailbreak, but want to play games like Dead Trigger 2 on iOS 6, here is how. I remember back when I first encountered the message “You must upgrade to version X.X” when trying to play Baldur’s Gate on my iOS 5 device. The thought of losing all my hard work on customizing my device just the way I liked it, was just a bit too much to take. So as the determined person I am, I set off to find a way to get around yet another road-block set by the AppStore. After a bit of research and trial & error, I was able to get Baldur’s Gate working on my device. Well, now the time has come again where iOS 6 is no longer the latest and greatest. So if you have a jailbroken iOS 6 device and want to play the new Dead Trigger 2 without upgrading to iOS 7, here’s how. Disclaimer: Modify devices and apps at your own risk! Making changes to either system files or app files as listed below could cause harm to your device or application. PocketMeta does not take responsibility if you void your warranty or damage your device. All data and information provided on this site is for informational purposes only. PocketMeta makes no representations as to accuracy, completeness, currentness, suitability, or validity of any information on this site and will not be liable for any errors, omissions, or delays in this information or any losses, injuries, or damages arising from its display or use. All information is provided on an as-is basis. So, here’s what we’ll need to change Dead Trigger 2 into a iOS 6 compatible device. You’ll need an application to open the contents of a IPA file, which I used WinRar. 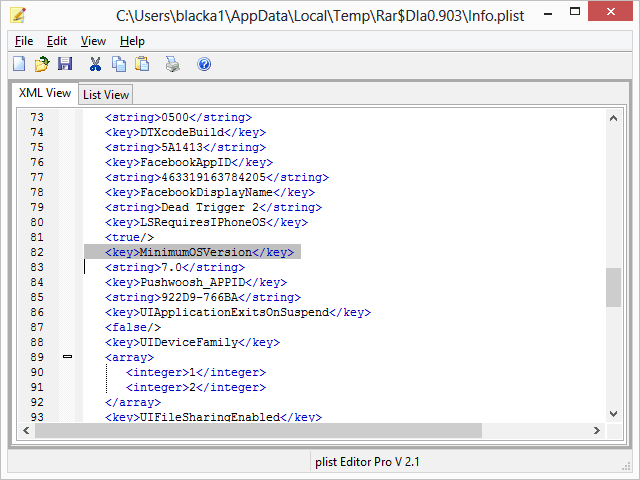 If you’re using a PC, you’ll need a application to edit PLIST files, I used Plist Editor which is free to download. In order to obtain the Dead Trigger 2 IPA file, you’ll need to download the file through iTunes. In order to do this, you’ll want to access the iTunes store on your computer without your device connected. This will avoid any errors about the version being too low. Once the download has been completed, you’ll need to navigate to the folder path where iTunes stores its downloads. 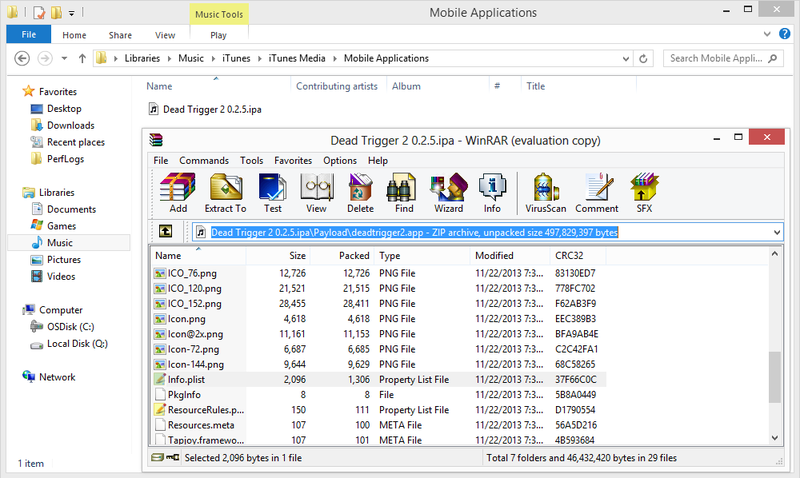 Once you’ve downloaded and located the Dead Trigger IPA file, you’ll need to open the file with WinRar. Within WinRar you’ll want to navigate to this path. Locate the Info.plist file within WinRar and open the file with a plist editor. Save the document. You’ll be asked by WinRar if you wish to update the archive with the saved file. Click yes to apply the update to the IPA. I would suggest you verify that the Info.plist file was saved by opening the IPA again in WinRar and double check that the value is still set to 6.0. That’s it to modifying the app to run on a lower system. You won’t be able to install the IPA file through iTunes, so you’ll have to use a application like iFunBox or iTools in order to install the modified app to your device. I would recommend iTools as it’s a much cleaner and easier to use application. There have been some reports that this is possible to do without a jailbroken device, but I have not been able to verify that. This method can be used with other applications as well, but as always it can cause stability issues with either the device or the app itself. I would not recommend spoofing the version more than one back. e.g. 7.0 to 5.0, etc. If anyone experiences an issue with Dead Trigger 2 needing to update after you’ve loaded it on your device, just follow the exact same steps again. iTunes will overwrite the old version with the new version and whatever application you install the IPA with should update the app accordingly.